Soak the mushrooms in hot water for at least 30 minutes. Set a large pot of water to boil & then turn it down to simmer. Drain the mushrooms, discard stalks and finely dice. To make the dumplings: Peel and microplane the ginger to yield 2 tablespoons. Wash and trim spring onions. Chop 2 finely and julienne the remaining spring onion. Carefully slice the chilli in half, scrape out the seeds and membrane and julienne. Reserve the julienned chilli and spring onion for the garnish. Combine chicken, mushrooms, chopped spring onion, ginger, one tablespoon soy sauce, sesame oil, salt and pepper in a bowl, then beat the egg and mix and mulch it in well into the chicken mixture with your hands until combined. Clean down and dry your work space. 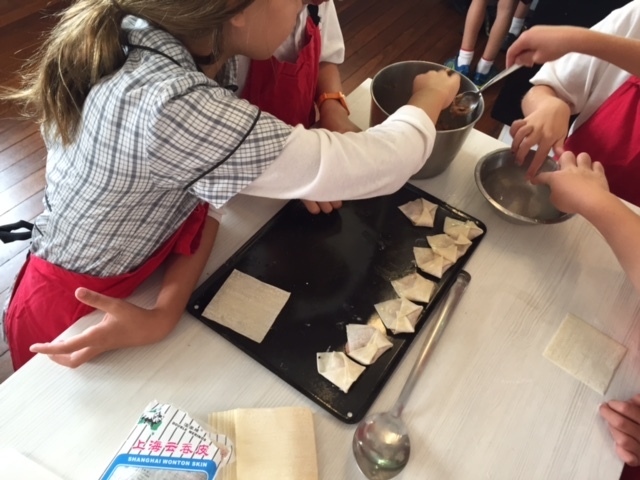 Lay one wonton wrapper down per person, then place a teaspoon of filling in the centre of each wrapper (don’t overfill!) and brush edges with a clean finger dipped in a bowl of cold water. Bring three sides of each wrapper up to meet the centre, then press together to seal the edges to form a tricorne. Press again at the ends of each point and in the centre. Continue until you finish the dumplings. To make the dressing: peel and finely grate the garlic. Whisk the chilli oil, garlic, remaining soy sauce and black-rice vinegar in a medium bowl. 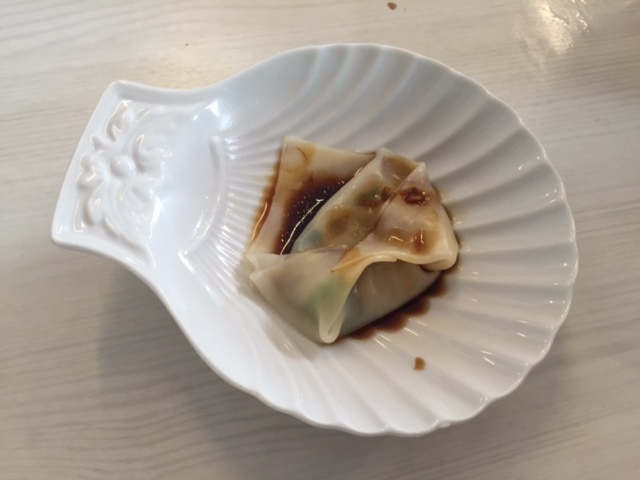 Cook dumplings a batch at a time for about two minutes in simmering water until they float to the surface. Drain and divide among the serving plates. Spoon the dressing generously on top, scatter with the reserved chilli and spring onions and serve.